- A selection of the 150 loveliest international restaurants, that each have a unique story to tell- Each selection features 20 signature dishes- An exclusive selection made by popular food blogger Amélie Vincent"I am lucky to be surrounded by inspiring chefs from all over the world. They are all different, and are gifted with a lot of emotion and sensitivity. Through their work and passion, they share pieces of art and culture and make me feel human and alive." - Amélie Vincent Food travel is a hot topic and pursuit, but finding the ultimate restaurant in a metropolis is often challenging and can be disappointing. Enter 150 Restaurants You Need to Visit Before You Die, a selection of the 150 must-visit restaurants around the world. Amélie Vincent, also known as 'The Foodalist', has several of the best chefs on her contact list and selected only those places that set themselves apart with their menu, design, originality... In short, she gives you the ultimate reason why you need to go there. 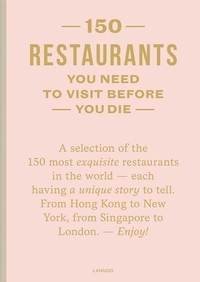 150 Restaurants You Need to Visit Before You Die is a bucket-list restaurant guide and the sequel to the equally standout book 150 Bars You Need to Visit Before You Die ISBN: ISBN 9789401449120.